Hard plastic, zip-on snake guards are hot and make you look like a Storm Trooper. We know you know that - it's the reason you have the Imperial March from Star Wars stuck in your head for days after wearing them. Try these Chippewa Men's 17 Inch Waterproof 25110 Pu ... (see full details) (see specifications) #CHP25110. Hard plastic, zip-on snake guards are hot and make you look like a Storm Trooper. We know you know that - it's the reason you have the Imperial March from Star Wars stuck in your head for days after wearing them. Try these Chippewa Men's 17 Inch Waterproof 25110 Pull-On Espresso Boots instead. They're lighter, work just as well, and are more comfortable than your old guards. 17-inch uppers provide plenty of protection from pesky snake bites. They wrap your feet, ankles, and calves in a brown, briar pitstop leather and espresso vipercloth, giving you superior protection. Depending on your height, the rugged uppers stretch to the bottom of your knee. Buckles at the top and the bottom allow you to adjust them to fit your feet and calves. Lined with Ruby Nylex, these men's boots are both waterproof and breathable. They're non-insulated, so your calves won't get hot and sweaty like they do in old-fashioned, hard plastic snake guards. To prevent water from seeping in and ruining your day, Chippewa uses Chip-A-Tex waterproof booties within the leather boots. Goodyear leather Welt construction makes sure the tough outsoles are carefully stitched to the tall uppers, giving you a long-lasting pair of brown boots. Bontex insoles provide cushioning and comfort for your feet. The durable outsoles are brown Vibram Robinson Gumlite soles that can also stand up to angry fangs. Step confidently through dense underbrush or tall grass, knowing that whatever's there won't get through your Chippewa boots. Steel shanks and 4 iron rubber midsoles lend you even more support as you go about your day. When snakes are around, you've got to be smart. Show your intelligence by wearing a pair of Chippewa Men's 17 Inch 25110 Pull-On Espresso Snake Waterproof Boots. Order yours today! This model of Chippewa boot seems to be very high quality, but it is made in China. Unlike the other Chippewa snake boots, this one is waterproof. Another difference is that this boot has a thick, comfortable cloth lining inside, instead of a leather lining. I'm 6' and the boots come up almost to my knees, but they are not heavy. The tread is not extremely deep but should give enough traction. These are beautiful boots that appear to be very well made. 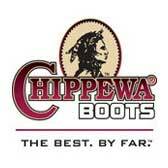 Chippewa has a solid reputation that can be trusted, but I will note that this model of boot is made in China. I'm 6' tall and these boots come up almost to my knees, but they don't feel heavy. The leather is very high quality. I've only walked around the house, but they feel comfortable. Unlike the other Chippewa snake boots, these are supposed to be completely waterproof. Another difference is that the inside lining is not leather, but a thick, soft, material. I ordered a size 10 which is my normal size, and I believe that it is the right fit. I did think about trying a half size smaller, but some slipping in the heel is normal before they are broken in. The tread on the bottom is not extremely aggressive, but should be fine in slippery mud. These Chippewa boots can be used for a variety of uses. They are a great fit. I would get one size wider than usual because the waterproof lining makes them a little snug unless you wear a light sock. Quality Leather, Great Looks, Great Protection and Waterproof? What else could you be looking for? Okay, also make them available in black! Thank you so very much for getting this out to me. You will make my dad a very happy person as this is the only thing he asked for, for Christmas. :) This is my first order, but I will certainly be placing orders for the other men in my family. You have a wonderful holiday as well, and give your parents a great big hug. Chippewa Boots: Men's Waterproof 25110 Pull-On Snake Boots is being added to your cart.